I am not sure if I am vain, but a lot of people might think I am and that I am high maintenance too. Probably because I give effort to how I look like or what I want to wear. I dunno but maybe I was just reared this way and I am not gonna apologize for that. This is who I am and that doesn't mean it's wrong. I have lots of insecurities too, yeah, JUST LIKE ANY PERSON IN THIS WORLD. But I am slowly learning to embrace my flaws and loving the body I am blessed with. Although I have to admit I still want to make improvements physically. That ain't a problem too because it's how anyone progress somehow. I don't make it a goal to have perfection but some progress wont hurt right? My biggest problem physically is my skin especially having adult acnes. I didn't suffer from that when I was younger. It started when I finished my nursing board exams, the acnes just decided to pop out. This might be because of the stress brought about by starting to live in the real world where you gave to work and earn to live. TBH, I do use whitening products; not that I want my skin to be so fair. My skin is between fair and morena (common Malay brownish) and I am actually loving it. All I want is that it will be smooth, even-toned and poreless like Korean skin, but again not super fair. I believe that whitening products will give that to me - that youthful glowing skin. Because not only they have whitening properties they are also loaded with other skin nourishing properties. That's what I like about this products. The whitening properties I am only after because I have a lot of pimple marks and scars and these whitening products that I use helps in lightening them. Same goes for my elbows and knees, they are a bit darker than usual and I want them to be a bit lighter too. I also use more of them everytime I get tanned after a trip to the beach, because my skin doesn't go back to it's original complexion unlike other people. So that's why I am using these whitening products like KB. 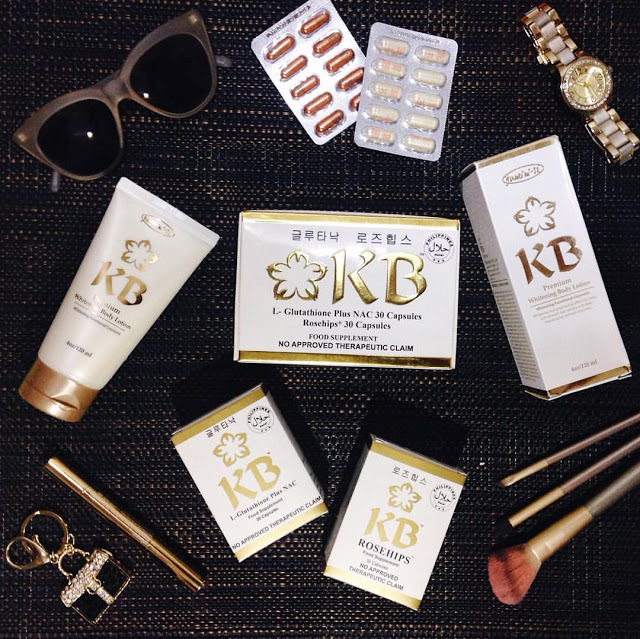 KB has a range of beauty products and supplements that will help get the real glow in you --what I want to achieve. Their products are produced through years of research and uses the most effective ways to whiten skin and make it youthful and glowing. To heck with the world when you want to be fairer and achieve good complexion, it's your body so do whatever you want with it! Be unapologetic about being beautiful!